This contract is for any construction industry tradesman to use for every domestic or small business contract. It is intentionally simple, so that your customer will not quibble. It does not matter what is your trade.The document is suitable to use for plumber, joiner, electrician, painter/decorator, roofer, tiler, glazier, brick layer and plasterer etc where the tradesman is working in someone’s home.You just add the details of the actual work to be done. This is the contract you need whether you are self employed as individual or work through a company. Extensive drafting notes explain every paragraph. This contract is for any work which could broadly be referred to as “construction”. It is not suitable for work worth more than, say £10,000. We have provided several payment options to make sure that you get paid what the client owes you for your work, in full and on time. 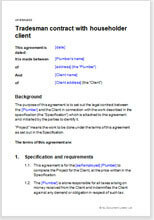 In case the client does not pay up-front, the contract contains alternative provisions for payment. Most importantly, the agreement provides the simplest way to deal with the Consumer Contracts (Information, Cancellation and Additional Charges) Regulations 2013.These regulations can hit construction industry workers hard. We have included full, simple, precise explanations and procedure. We lead you through this swamp so that your work is done and you get paid. Net Lawman offers several alternatives of construction industry and services contracts. For a contract drawn to favour the householder, or for larger building work, read all about them at Which Net Lawman construction contract?